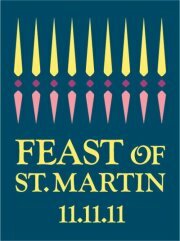 St Martin's Day, The Feast of St Martin, or even Martinmas takes place on the 11th of November. Parlour Tricks are choosing to mark this by holding a Martinmas party at a secret location in Dalston, featuring a procession through the streets, a 5-course feast with selected wines, and an after party. Come into our beautiful dining hall where we'll have our own bar stocked with exclusively British drinks from dangerous cocktails using Sipsmith's fine London spirits to sparkling English wines from the wine pantry, local micro brewery beers and scrumptious Somerset cider. For your entertainment we'll have a very special guest band who have been our favorite festival band all summer...and they're playing just for us! It'll have to stay a secret for a little while longer.... so stay tuned! For Afters we've got an earthy electro folk-off between DJ's Mojo Filter & Fear of Theydon. Both these two have exceptional taste in music and will be creating a heady late autumn scene to help us celebrate this ancient day!"